5, 4, 3, 2, 1 Blastoff! Whoo it’s time to plan tons of fun space themed centers and activities for your space theme! There’s just something about space that gets kids excited to learn and play. Grab your plan book and let’s get started! Oh and don’t forget to grab the FREE Star Constellation book in this post too! Just remember that preschoolers and even kindergartners will not be able to really understand many concepts about space. 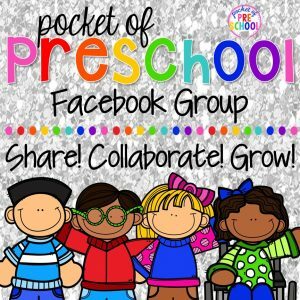 Sprinkle in vocabulary related to space, and teach those super basic concepts like night and day, the moon, the sun, and the planet Earth. I mainly use the space theme to teach various math, literacy, science, and motor concepts and skills with my little learners. All of the Space games can be found in my Space Math and Literacy Centers pack. Practice identifying uppercase letters, lowercase letters, and letter sounds with these Letter Rockets! Put out just a handful of letters or the whole alphabet depending on the age of your students. If you have three year olds, make this game easier by making it just a letter matching game (only put out the letter cards). 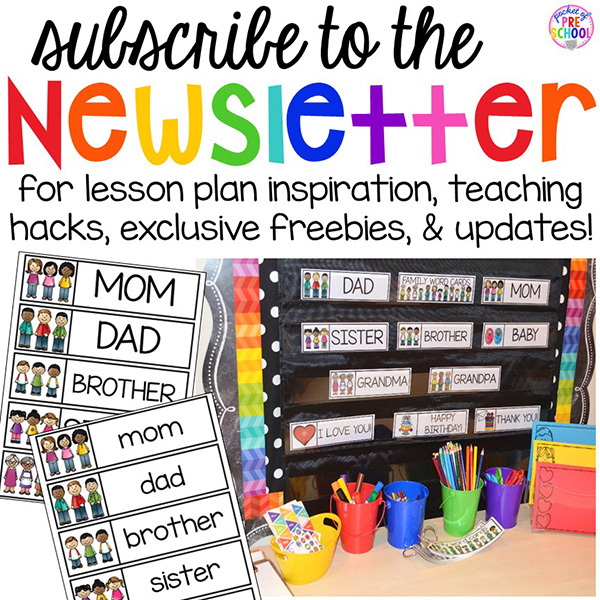 Make learning the letters in your name fun with this name rocket craftivity! Students cut out the rocket pieces (helping build those scissor skills) then write the letters in their name on the squares. The last step is to glue the point and flame on the rocket! The name rockets are super cute to hang up in the classroom too. If your students need extra support cutting out the squares, try these bounce back (aka loop) scissors. If a student needs extra support writing letters, write the letters in pencil then have the student trace the letter with a marker. There are so many beautiful planets in space so why not use them to practice writing letters! Students pick a planet, write the letter and build the letter with magnet letters! If you have older students, you can have them read, write and build their SIGHT WORDS on the mat! I didn’t have time to laminate the boards before this activity so I put them in these dry erase pockets. My kiddos LOVE letter hunts so I hid magnet letters in foil which we pretended were space rocks! Students opened up the space rocks (great fine motor work too), identified the letter and traced the letter. It’s fun to have a space vocabulary in the writing center! A space theme needs space vocabulary words, space writing paper, space stickers and METALIC CRAYONS or markers! The metallic crayons write on black paper, and they are sparkly too! It’s so important to use new writing tools to make the writing center inviting to students and to help them fall in love with writing and drawing! Build space words with magnet letters on fancy trays for table time or word work. I found these trays at the Dollar Tree in the party section. In your library, you can fill the bookshelf with space books for a space theme. This Space Themed booklist is packed with my favorite space books for little learners. Play dough trays are one of my students’ favorite things (and mine too). Students can use their imaginations with space themed play dough as they create and sculpt while exercising those little fingers! 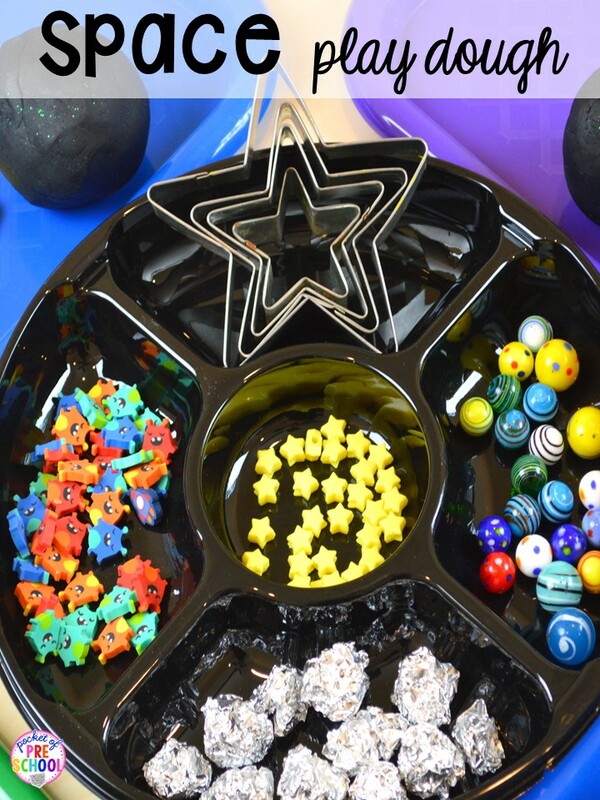 Grab some star cookie cutters, star pony beads, planets (marbles), space rocks (foil in a ball) and little alien mini erasers or counters and place it all in a sorting tray. This tray is a chip and dip tray from the dollar store. To make the play dough black and sparkly, I use this gel food coloring and glitter. Continue strengthening those fine motor muscles and have your students make space bracelets! Students lace star pony beads and cut straws on silver pipe cleaners. The straws will pop all over a bit when the students cut them, but it’s so much fun! In the sensory table, make a planet for students to explore! It’s black and neon fish tank gravel, glow in the dark ceiling stars and half of a space action figures set (the other half of the set is in the blocks center). Students count or identify the numbers to create Number Rockets. You decide what numbers and how many rocket puzzles to put out based on your students level. Space Alien Shape Clip Cards! Students identify the shape and clip the matching shape alien. Using clothespins sneaks in more fine motor work too. My little learners always have the option to play the game their own way. As long as they are learning something, I’m a happy teacher! Typically for this game, students roll the dice, build a cube tower with the corresponding number of cubes and place it on the number. This group of students decided to roll the dice and cover the corresponding number. To take the theme into the blocks center, I added space non-fiction books, space action figures set with space shuttles, space rocks (foil), blueprint paper, and space themed I Can Build Cards. The photographs and books inspire little learners to build and engineer something new that they normally wouldn’t build. I posted the space blueprints my students made too! Check out this space station a few students built. I challenged them to build a space station that was taller than them and they did! Giving students STEM challenges, forces students make a plan and have an end goal. Even though our little learners may not draw out detailed plans, they still are making ones in their heads and making changes as they go. Constellation Art! 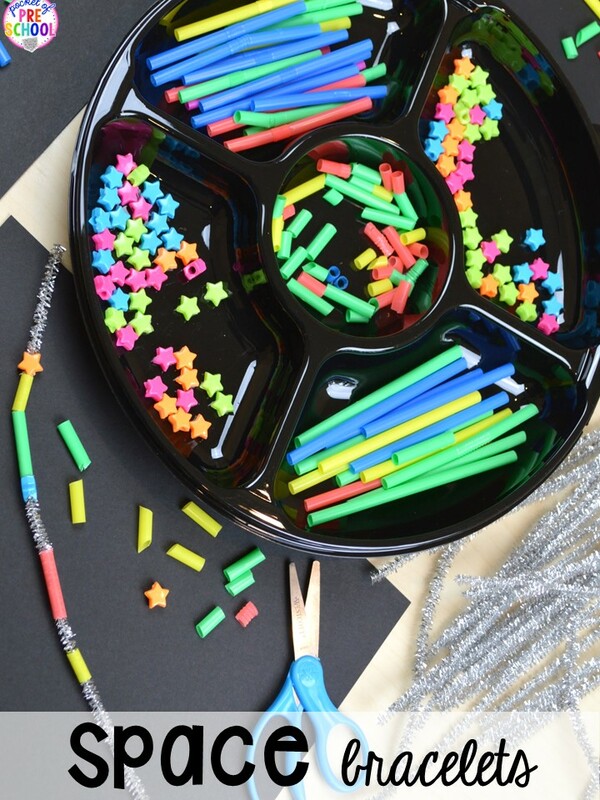 Set out this FREE Constellation book to inspire students to create their own constellations on black paper using start stickers and white crayons! You can even sneak in some math and talk about how a constellations are like a maps in the sky. Planet Art! Students roll paint covered marbles in a box or lid to create beautiful planets! You can have students cut out the circles using a stencil or you can cut them out beforehand. Night Sky Cookie Cutter Art! Grab some white paint and have students stamp star cookie cutters to create a beautiful night sky. Space can be a hard concept for little learners to understand. Set up a space science table to make learning all about Space (Day and Night, Shadows, Constellations, Moon, and the Planets) fun and hands on in your classroom! There are so many hands on activities you can put on the science table for space. Grab my Space, Sun, and Moon science unit from my TPT store HERE. 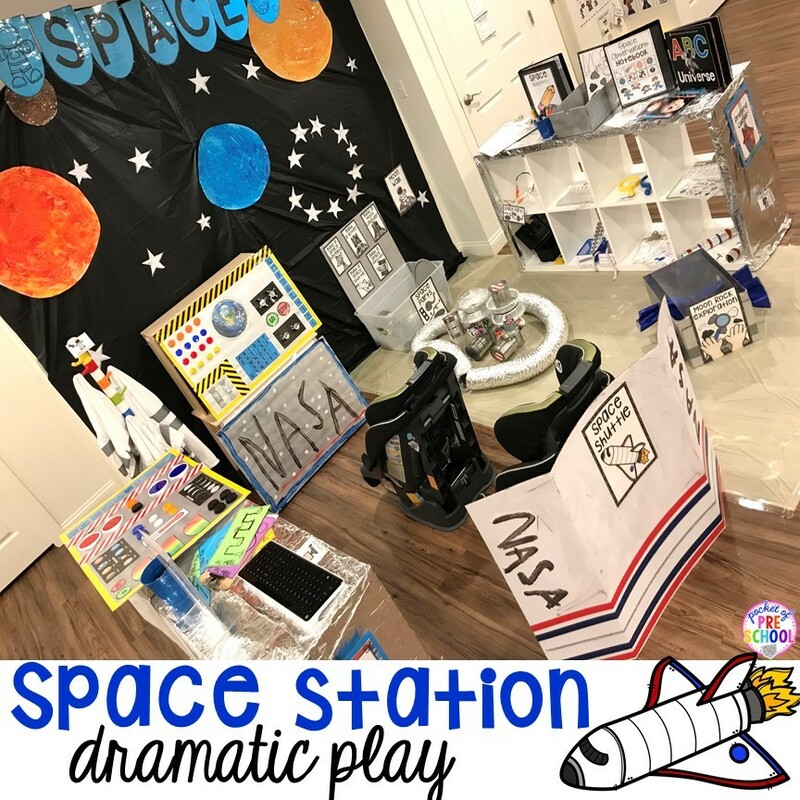 Don’t forget about the dramatic play center! Change it into a Space Station. Check out how I did it in THIS detailed blog post. Want ALL my Space themed math and literacy printables? Grab them in my TPT store HERE! I did all the work for you. Just print, prep and play! Love these space centers? Pin this image!